(Newser) – This year saw the worst mass die-off of coral ever recorded at the Great Barrier Reef, with the "most-pristine" parts of the reef being hit the hardest, the Guardian reports. 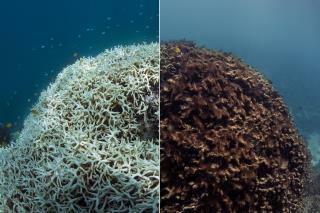 One 430-mile section in the northern portion of the 1,400-mile-long reef lost 67% of its shallow-water coral. All told, the Great Barrier Reef lost 22% of its coral in 2016's bleaching event. "To see those sections, two-thirds of the northern section, dead, is catastrophic," an Australian environmental minister tells the New York Times. The northern section of the reef had historically been the least damaged by human activity. The coral bleaching was caused by warming waters; the southern portion of the reef escaped great harm thanks to a cyclone that lowered water temperatures. Well, at least those using this website know the cause ! overpopulation Worldwide !!!!! Now persuade those in charge that we need to do something about it !! ___ Or else.---------- ?